The two day Event got under way at midday on Saturday 12th August with just under 30 yachts competing in three separate classes. Yachts had come from all over the west coast to take part, some using the opportunity to sail in the O'Sullivans Marine 100 mile race the previous weekend to make the journey to Clifden a potential prizewinner. Conditions were perfect for racing with 20kts of wind and plenty of sunshine when OOD Eddie Cats set the marks for the first race, and a very competitive afternoon of racing was had. It can be seen from the results and times that there was some very close competition. Two windward/leeward courses were run on Saturday, and a very exhilarated gang of competitors came ashore to await the results of the first days sailing, enjoying a mountain of barbeque food and a few pints at the clubhouse as well. While the yachts were at sea dinghy races took place and some exciting competition was had there too with a very mixed fleet of craft crewed by some keen and able youngsters. Despite the forecast of wet weather, Sunday was fine and sunny with a stiff breeze of wind blowing a shade west of north. Today there were shore activities for the family such as face painting and welly throwing. Also two more dinghy races took place. 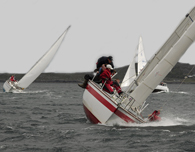 The first yacht race was again windward/leeward which more than warmed everybody up for a coastal race around Cruagh Island ( which is north-west of Clifden Bay). Class 3 on Sunday had a general recall on the first race which made their start very exciting. At the start of the coastal race the wind freshened just before the gun to make a challenging start to the race, things resulted in general recall and restart. After the restart the boats stayed bunched together for the early part of the race and then a number of the yachts tacked inshore others coosing an offshore course, which then spread the fleet out and by the time they rounded Cruagh Island for the downwind leg they were well spread.On the downwind leg back to Clifden Bay there were a lot of colourful spinnakers flying. The finish line for this race was under the Clubhouse and spectators were treated to the sight of the fleet running at full speed downwind to the finish under spinnakers. A patient crowd of sailors and competitors alike waited on the final details of the results. The prize-giving took place at half past seven with Paul Ryan and Commodore Julia Awcock presenting a mountain of prizes to the winners in front of a rowdy and appreciative audience. The event was a great success, and would not have been possible without our sponsors and those that gave their time and effort to organize the event. Also a huge thank-you to the many boats which came to compete.